I've noticed that many of the promos issued in the last decade are either not selling or when they do, are going for $1.00 to $2.00 a piece. This is a downward price move as compared to what they used to sell for a few years ago and I expect that issue to continue. However, I have also seen a commensurate upward price trend in the last couple of years for harder to find promo cards, regardless of when they were made, although those from the 1990's are rising more determinatively. For example, Marvel, Disney and Star Wars collectors, for ones, are no longer afraid to dish out BIG BUCKS to complete their master collections as corroborated by some of the prices realized on Ebay and elsewhere. This tells me that after having found all of the insert, autograph and costume cards, these "genre" collectors wanted, they have started to focus on the promo cards. This is very important, because these type of collectors are the equivalent of the Dow Jones components in the stock market. In other words, they are the trend setters for the trading card collecting world. As their collecting habit goes, so does the rest of ours. The days of a $3.00 promo for some scarce 1990's cards have long since come and gone. The "great find" in a dealer's dollar box is no longer possible. The market is congealing around the harder to find cards. Voracious buyers, increasingly knowledgeable sellers and a true dearth in supply have confirmed that scarce promo card prices will continue to rise for the foreseeable future. Many non exclusive promo card collectors are realizing and appreciating the true rarity of some promos because no matter how hard and where they look, they come up empty handed! Yet, there are still some bargains to be found by the astute collector, albeit that window is slowly closing. Do you have a promo card that you have been looking for but which has eluded you? Please tell us which card(s) and how long you have been searching! Hammer Horror ser 2 P2 ( werewolf variant ). Although these two cards are missing from my sets there is no point in me looking for them. No UK dealer would have these cards on their table at a show so if they don't pop up in front of me on ebay i would have nowhere else to look. As a promo collector, I am Always looking for Rittenhouse P3 Promos (Binder Exclusives). The idea is to try and find then for cheaper than the cost of purchasing the binder (with the promo included) for sets I don't collect. But as you mentioned as the completests want all cards / inserts / autos / sketches (and Promos), the P3s become harder to find on their own. Yes, I would agree that some Marvel, Disney, and Star Wars collectors, who might have been content with what they had, have set their sights on becoming completist collectors. Now, they want promo cards, sell sheets, posters, store signs/window decals, etc. I think these days, there are also collectors who sold some of their promos 8-12 years ago and are starting to buy back what they let go and have found it a good time to buy. In my case I've been able to buy some promos I didn't get when they were new (some Fish-O-Saurs), and replace a couple that I had sold, and even finished a set (DinoCardz-Pepsi) that had been one card short. For me a few of the Dark Horse signing cards remain quite elusive. It seems like the same 10-12 come up for sale and a few others come up occasionally but rarely does one come up that I don't have. I would like to see "Starship Troopers: Insect Touch" or "Black Cross: Dirty Work," or "Blade of the Immortal," or the Kiss card from 2001 come up for sale. I'd like to see what they look like. The weird thing with DH signing cards is that some are hard-to-find, but when they do get offered, they're $3-10. You'd think the Star Wars ones would be more valuable, but it seems people were grabbing what they could of those back then, thinking those would be the hard-to-get cards later. It has turned out that those are actually easier to get (even the once-scarce "Protocol Offensive" can be found if you keep your eyes open). It's a few of the lesser-known titles that are the ones that you don't see. There was a time when you could get the Hammer Horror Series 2 werewolf variant (right after Cornerstone's remaining stock was sold). I had one but later sold it - haven't seen it for sale since. It's tough to find those Avengers Series 1 promos too. I have three of them and haven't seen one I don't have for sale in years as well. A bunch of oddball Biosphere promos went up for sale earlier this month. All I can say is you have to keep your eyes open. I found a cool pile of promos at a local flea market last year. There was nothing there that anyone could call a big find but a few of the cards might be considered uncommon. I agree that some of those DVD/VHS insert cards can be really tough to find. I'm just wandering which DVD/VHS promo cards you are referring to. Catskilleagle reminded me that in addition to promo cards, people are also collecting many other card related items including sell/sales sheets. Wen I bought DeFranzo's collection, I discovered he had about 1,000 of them which after culling his collection from mine, I ended up with around 1,500 different ones. It seems people's interest in these sheets is also increasing exponentially. They are beautiful in their own right but are much more delicate than the corresponding trading cards considering they are printed on flimsy paper and thus, easily subject to tears, bends, creases etc.. There is already a thread on this forum about how to store them and will not belabor that point. I try to never add a folded sell sheet to my collection but I do not know whether any specimens of that sheet were distributed without the folds. This would be an interesting investigation to determine who has a folded sell sheet of a particular title and who has found one in pristine condition. I'm also wondering how many people on this forum do collect sell sheets and what their "holy grails" are. Can we hear from you? I see the Werewolf card for sale on that unmentionable site. I must warn you that the price is scarier than any Hammer Horror movie. Thanks Jess, yes i saw it and that is where it is staying! I have collected sell sheets for a long time. Which folded ones are you talking about and I will see if I have unfolded ones. Quick questions for promo collectors without starting a new thread, do promo cards created for products that were not made have their own collectors? Are they viewed as being rarer or more in demand when the set does not get released? I'm speaking of only licensed promo cards now, not the "fake promos". I don't know if there is a promo collector who focuses on cards for cancelled card sets but there might be. They are certainly curiosities in the promo world that might appeal to some general card or memorabilia collectors who don't avidly collect promos (e.g. a fan of the tv show "Northern Exposure" might want the promo when made aware of if) but they don't have a premium attached to them just for that reason. "I have collected sell sheets for a long time. Which folded ones are you talking about and I will see if I have unfolded ones." Thank you for the kind offer! here are the ones I have that are folded. 1993 Bench Warmers Series II "trading cards never looked so good). has multiple small images of models. 1995 Benchwarmer calendar(shipping begins June 94). 1992 Benchwarmer Premier Edition(the most refreshing novelty product to hit the market this year). 1994 Car & Driver Cadillac Collection RPM(2 different sheets). Please email me if you find any of them. 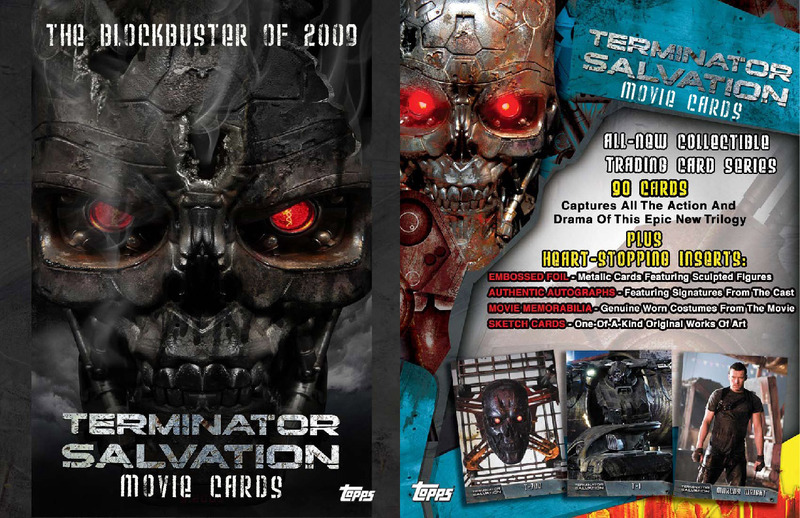 I would like to see a scan of the Terminator Salvation - Topps since I never saw one Zane DeVan if you can. Albert , I marked what I had for you on your list. I thought I had avengers series 1 but I don't, the series 2 Avengers is not folded. On the benchwarmers premiere I have a folded sheet but it doesn't have the wording you listed. For the gi Joe, if you are talking about the comi images one I have an unfolded one. The only other GI Joe sheet I know about is the Impel one. That's awesome. I'd be happy to trade with you for promo cards you may be missing or in some other way that works for you. Please email me: promoking@aol.com. Thanks Zane for the explanation. I saw the digital copy of the sell sheet but I never saw one printed as pictured below. Back in 2009 Topps stop producing sell sheets but who knows now. I will put it on my want list in case.